The Motorola Talkabout® MU350R series radio is bold, powerful, and adventurous, but most of all, its arrival changes the landscape of two-way communications. Pair your MU radio to a BLUETOOTH®* headset and communicate wirelessly. Through the use of BLUETOOTH®, your Motorola MU350 series radio lets you cut the cord and allows you to communicate without getting tangled up. The Motorola Talkabout MU350R’s Bluetooth connectivity is an exciting feature for campers, motorists and construction workers. 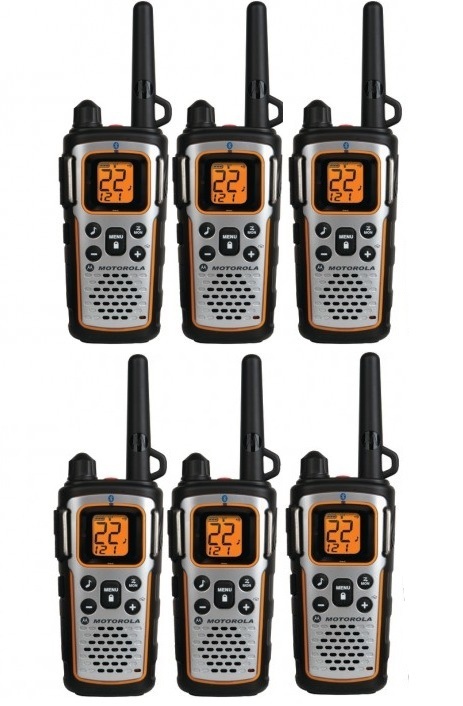 As a walkie talkie, the Talkabout MU350R offers an average range and a full set of features. Its maximum effective range is 35 miles, although you have to meet certain environmental conditions to attain that range. If you are using an FRS frequency while hiking through the woods, you may only get an effective range of 1 or 2 miles. The MU350R has access to both FRS and GMRS frequencies, but before you use the GMRS channels, you must have an FCC license. Its emergency alert feature, built in LED flashlight and NOAA weather alert channels provide a total emergency preparedness communication solution. So, escape to the great outdoors with confidence that others can be informed of any dangers that may come your way. The flashlight feature offers peace-of-mind during evening adventures or unexpected emergencies and power outages. The NOAA channels provide emergency alerts including tornadoes, winter storms, severe thunderstorms, flash floods, emergency evacuations and Amber Alerts. With an IP-54*** rating, the MU series flaunts its weatherproof ID design making it ideal for protection from not only dust, but wet weather conditions be it snow or rain splashes. Want to keep in touch with changing weather conditions during your family camping adventure? No need to stop the fun — weather alerts will provide your group with warnings of incoming storms or dangerous conditions. And, by tuning in to one of 7 NOAA channels (National Oceanic and Atmospheric Administration) on your MU350R radio, you will always know what to pack with continuous local and regional weather broadcasting. The MU series include an emergency alert feature, allowing you to enjoy your escape to the great outdoors with confidence that others can be informed of any dangers that may come your way. When the alert button is activated, the radio transmits an alert siren followed by transmission of spoken or incidental sounds. This allows you to send the signal to other radios and warn of impending danger. There’s also a built-in LED flashlight for peace-of-mind during evening adventures or unexpected emergencies and power outages. A light source is always essential during any emergency situation. It’s crucial to be able to see what you are doing and where you are going. The MU series has a built-in LED light which offers emergency lighting when needed. Keep your Motorola two-way radio charged on the go using this USB car charger that plugs into your vehicle’s cigarette lighter. Whether you are an outdoor enthusiast or just making sure you and your family are informed, you will have 24/7 access to alerts ranging from flash floods to tornado warnings to national emergencies. Use the radio feature to team up with someone in your neighborhood to check on each other in case of emergencies. The MU350 provides the ideal combination for those who want real time accurate weather monitoring capabilities and the ability to communicate in case of emergencies. When you are hiking up a steep mountain trail, you really need to keep your hands free to brace the rocky terrain. With iVOX acting like a speakerphone and allowing hands-free communication, you can keep on moving without stopping to answer a call. The Talkabout® MU series has full 22-frequency capacity with 121 privacy codes to reduce interruptions. 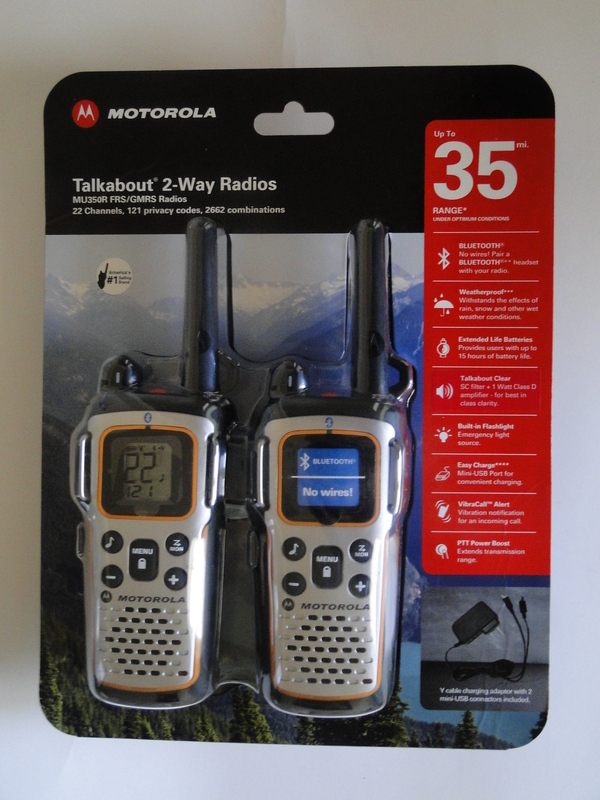 The Motorola QT (Quiet talk) functionality allows the radios to be set so they can communicate with other compatible Motorola products, adding yet another level of distinction from the other manufacturers. Are you running out of battery power and with no power outlet around to recharge the batteries? Just pop in 3 AA batteries and your unit is operating again for another 15 hours of estimated talk time. Are you finding yourself asking what the other party was saying because it was just not clear? Through the use of Digital Signal Processing technology the MU series provides best in class audio clarity not to be found in any other 2-way radio. Over and out! Boasting a high efficiency class D amplifier, the MU series radio delivers enhanced sound quality by reducing distortion at high volumes. The collective energy wasted in powering handheld electronics has become a Global issue. Most of the energy wasted while charging a mobile device occurs within the charge. On an individual basis, the amount of energy wasted per year is negligible. However, there are hundreds of millions of chargers in use today. The large-scale incorporation of energy efficient chargers benefits the planet both economically and environmentally. The MU series does its part by using the latest technological design to produce a high efficiency wall adapter which consumes one half watt of power during idle conditions.